Objective: To describe the recent epidemiology and clinical features of paediatric tuberculosis (TB) in New Zealand (NZ). Methods: A retrospective review was conducted of clinical, laboratory, and radiology records of children <16 years old diagnosed with TB between January 1992 and June 2001 in nine NZ health districts. Results: A total of 274 patients <16 years old were identified; the average annual TB rate was 4.8 per 100 000. Rates rose over time reaching a peak of 10.1 in 1999. Rates were highest in under-5 year olds, at 6.2 per 100 000, and varied by ethnicity: African 575.2, Pacific Island 15.2, Maori 6.4, Asian 5.6, and European 0.6. Seventy two cases (26%) were foreign born. Thirty six per cent of cases were not detected until they presented with symptoms and of these 44% had no known TB contact. Most cases were identified by contact tracing (48%) or immigrant screening (11%); 43% were part of outbreaks. Miliary TB or meningitis occurred in 8% of patients, two of whom died. Drug resistance was found in 7% of culture positive cases and no HIV co-infection was found. Conclusions: A resurgence of TB occurred among children in NZ between 1992 and 2001 predominantly involving non-European and immigrant groups. Despite established contact tracing and immigrant screening programmes, many cases were part of outbreaks, remained unidentified until symptoms arose, or had no known TB contact. These findings point to an unrecognised burden of adult disease, ongoing community transmission, and missed opportunities for prevention. Further study is required to confirm these hypotheses. Understanding childhood TB is important because it differs from adult disease, particularly in pre-adolescents, and is also a marker for disease transmission within a community. Compared with adults, infection in children progresses to disease more rapidly and more often, and extrapulmonary disease is more common.8,9,10 Childhood TB indicates recent acquisition of Mycobacterium tuberculosis, and children with latent infection provide a reservoir for future adult disease.8,11,12 Despite this, relatively little is known about the burden of paediatric TB in either developing or industrialised countries.13 To inform public policy and contribute to the global picture of TB, we describe the recent epidemiology and clinical features of TB in New Zealand children. Children under 16 years of age diagnosed with TB between 1 January 1992 and 30 June 2001 were identified through the national TB notification system and hospital discharge coding data. A standard proforma was used to extract data from clinical, laboratory, radiology, and public health records for cases in the study area. This included detailed demographic data, which allowed a proxy measure of socio-economic status to be assigned using the New Zealand Deprivation Index (NZDep96).15,16 NZDep96 used pooled census data from 1996 for eight dimensions of material and social status, including household crowding, to measure socio-economic status at the neighbourhood level (median population 90 people). A score of 1 to 10 was allocated to each neighbourhood, decile 1 representing the least deprived 10% of neighbourhoods and decile 10 the most deprived 10%. Chest radiographs were reviewed in equivocal cases by paediatric radiologists working with the TB clinic at Starship Children’s Hospital. Individuals met the case definition of TB if they had either (a) positive culture of M tuberculosis or Mycobacterium bovis, or (b) clinical evidence of disease, defined as two or more of the following: (i) supportive epidemiology (TB case contact or membership of a high risk group), (ii) positive 5 IU purified protein derivative Mantoux test, (iii) characteristic chest radiograph findings (primary complex, hilar or mediastinal lymphadenopathy, cavity, miliary pattern, pleural effusion, or any infiltrate or opacity not explained by another disease), (iv) symptoms suggestive of TB, not otherwise explained (for example, fever or cough for more than 2 weeks, night sweats, weight loss, lymphadenopathy), and (v) findings on microscopy, histology, or polymerase chain reaction suggestive of TB.9,17–19 A positive Mantoux test was defined as transverse induration ⩾10 mm except in those with a close TB contact, regardless of BCG status, and in children under 5 years of age with no evidence of BCG vaccination, where the cut off was ⩾5 mm induration. Individuals were excluded if they had latent TB infection only (positive Mantoux test without evidence of active disease) or non-tuberculous mycobacterial infection. The site of disease was categorised as pulmonary (which included parenchymal, pleural, and hilar or mediastinal lymph node involvement), pulmonary and extrapulmonary (which included miliary disease), or extrapulmonary. Data were single entered into an Access database (Microsoft Corporation, Redmond, WA, 2000) and each datum verified independently against the original data proforma. Descriptive statistical analysis was performed using SPSS statistical software, version 11.0 (SPSS, Chicago, IL). Population denominators used to calculate rates for the study area were derived from 1991, 1996, and 2001 census data, with linear interpolation used to calculate denominators for intervening years. Grouped total responses for ethnicity were used, which allowed for multiple ethnicity in individuals. Approval for this study was given by all regional ethics committees including the lead Auckland Regional Ethics Committee. Of 3416 TB notifications during the study period, 401 (12%) were in children aged less than 16 years, of whom 346 (86%) were resident in the study area. Seventy eight of these 346 notifications (23%) did not meet the case definition and were excluded. The major reasons for exclusion were misclassification of those with normal chest radiographs (53%) and non-tuberculous mycobacterial infection (25%), with assorted other reasons accounting for the remainder. Clinical records could not be located for 10 notifications. However, a further 11 cases (4.0%) that had not been notified were identified through hospital discharge codes, giving a total of 269 cases in the study area. Five cases managed in the study area but originating outside it were included in the series of 274 but excluded from rate calculations. The average annual rate of TB was 4.8 per 100 000 children under 16 years of age. 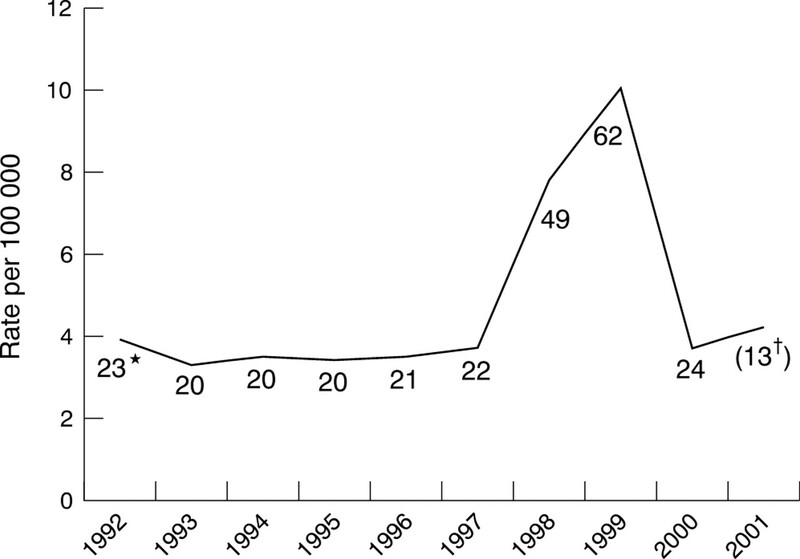 Rates peaked in 1999 (fig 1) when 33/62 cases (53%) were known to belong to outbreaks, defined as two or more related cases not of the same household, compared to 118/274 cases (43%) for the whole study period. The number and proportion of cases born overseas peaked at 23/49 (47%) in 1998. Average annual TB rates per 100 000 by ethnicity were as follows: African 575.2, Pacific Island 15.2, Maori 6.4, Asian 5.6, and European 0.6. TB was clearly associated with socio-economic deprivation in this series, with a median NZDep96 score of 9 (fig 2). Annual tuberculosis incidence rates in New Zealand children below 16 years of age between 1992 and 2001. *Absolute numbers of cases; †2001 included January 1st to June 30th only. Social deprivation in New Zealand TB cases <16 years of age 1992–2001 versus all NZ births 1992–2001 (data source: Birth Registration Dataset, NZ Health Information Service). *Decile 10, most deprived 10% of population. Over half the cases were detected by contact tracing (132/274, 48%) or immigrant screening (29/274, 11%). Additionally, 98 (36%) were not detected until they presented with symptoms and, of these, previous contact with a person with TB was known in 43 instances (44%). These symptoms had been present for 2 or more months at diagnosis in 32/76 children (42%) where symptom duration was known. One quarter of cases (24/98) detected because of symptoms were born overseas, and over half of these (13/24) were outside the criteria laid down for TB screening as part of the immigration process (based on age (n = 10) or country of origin (n = 3)). Forty one of 64 immigrants (64%) with a known date of arrival were diagnosed within the first year after arrival and 58/64 (91%) within the first 5 years (median time to diagnosis was 4 months). A summary of the demography, clinical features, investigations, treatment, and outcome of the 274 cases is given in tables 1 and 2. The TB rate per 100 000 for the 0–4 year age group was 6.2, for the 5–9 year age group 3.7, and for the 10–15 year age group 4.5. Pulmonary TB was the most common form of disease and only 97/221 (44%) were symptomatic at diagnosis. Twenty three of 53 (43%) extrapulmonary cases had miliary disease or meningitis, while 24 (45%) had nodal disease. HIV status was known for 17 cases, mostly Africans, all being negative. Mycobacterial cultures were performed in 170 children (62%) and were positive in 102/170 (60%), all yielding M tuberculosis. Cultures were performed in a greater proportion of under-5 year olds (80/98, 82%) and 10–15 year olds (64/92, 70%) than in 5–9 year olds (26/84, 31%). One or more positive cultures were obtained in 57/112 patients (51%) having gastric aspirates, 27/43 (63%) giving sputum samples, 17/30 (57%) having tissue biopsies, 9/13 (69%) having pleural aspirates, 7/15 (47%) having bronchoalveolar lavage, 7/105 (7%) having early morning urine samples, and 4/26 patients (15%) having cerebrospinal fluid culture. Most drug resistance was to isoniazid alone. The single multi-drug resistant case was a 12 year old girl from Africa, whose isolate demonstrated resistance to isoniazid, rifampicin, pyrazinamide, ethambutol, and streptomycin. Treatment was usually with isoniazid, rifampicin, and pyrazinamide. Of those receiving directly observed therapy, half (57/109) received it for 6 months or more overall, the proportion being two thirds (64/99) in the latter part of the study period (1999–2001). Minor and transient adverse effects associated with antituberculous medication occurred in 33 cases (12%). Three children in the series died, and in two cases the death was directly attributable to TB. A 3 year old Asian girl from a socially advantaged neighbourhood who had not received BCG immunisation died from disseminated disease. A 4 month old Maori girl with unknown BCG status who lived in a middle class neighbourhood died in the community without presentation to health services. A post mortem revealed disseminated TB. Both children were New Zealand born and in neither case was a source found. The steady decline in TB in New Zealand stopped in the late 1980s and was followed by an increase in notifications, mirroring the global trend.4 This study demonstrates that the incidence of TB in children in New Zealand has followed this pattern with a clear resurgence in childhood TB occurring between 1992 and 2001. Another important contributor to the TB resurgence appears to have been immigration from countries with a high TB incidence, also reported from other industrialised countries.24–26 Immigration to New Zealand has increased over the last 10 years.27 While one quarter of cases in this study were born overseas, the proportion is probably higher for their parents given that 69% of all cases of TB in New Zealand (adult and child) were born overseas.28 This may be part of the explanation for the high rate in Pacific Island children, the large majority of whom were born in New Zealand and tend to live in poor socio-economic conditions.25 It is notable that Pacific Island children’s rates of TB remain high, at around 12 per 100 000 annually, even after exclusion of cases in 1999, when the large outbreak previously described occurred. A significant number of overseas born cases may have become infected in New Zealand given that one third were diagnosed more than 1 year after arrival and 9% more than 5 years after arrival. The clinical features of TB in this group were broadly similar to those previously reported in children.10,11,29–32 One exception was a high proportion of positive cultures: 60% when culture confirmation was sought versus 35–42% in previous similar series.29–31,34 Higher sampling rates in the youngest and oldest age groups, which tend to have higher culture yields, compared to the 5–9 year olds may have contributed to this finding. We usually omit cultures where there is a classical clinical picture and a confirmed contact whose TB isolate has known sensitivities. Where this does not occur cultures are sought and these data suggest that this effort is worthwhile. The emergence of drug resistance, albeit at a low level in this series, further supports this practice. The findings of this study identify a number of opportunities to reduce the burden of childhood TB in New Zealand. Thirty six percent of children were not detected until they presented unwell. These children are important because they represent missed opportunities for prevention. Over half had no known contact with TB, indicating that the source case remained unidentified, while the rest were not identified before frank disease developed. Improvements in contact tracing and outbreak management might reduce this disease burden. Delay in diagnosis, a feature of this study, compounds the problem of missed opportunities for prevention, potentially exacerbating the severity and spread of disease. Raising TB awareness among health professionals and the community is needed to reduce the spread of established disease.35 Gaps in immigrant screening may also play a role: visitors intending to stay for less than 2 years have been exempt from screening as have those from a number of Pacific Island nations and children under 12 years of age. These regulations are currently being revised.28,36 At a broader level, reduction of poverty, including household crowding, is another way in which the burden of TB might be lessened. Despite an established TB control programme, New Zealand experienced a resurgence in TB among children between 1992 and 2001, much of this seemingly attributable to an unrecognised burden of adult disease and to missed opportunities for prevention. Further studies are required to confirm these hypotheses. Controlling the inflow of TB across New Zealand’s borders is a challenge, while achieving optimal TB control within its shores is no less demanding. This is a matter not only of resources but also of partnership with communities at risk. This is a challenge that grows as globalisation brings the world increasingly to New Zealand’s doorstep. Drs Catherine Bremner, Wendy Walker, Noel Karalus, David Barry, Archie Kerr, and Philip Pattemore facilitated the work of SH in their respective centres. Drs Rita Teele and Russell Metcalfe assessed the chest radiographs. Ms Liz Sneyd helped with data analysis. World Health Organization. Global tuberculosis control: surveillance, planning, financing. WHO Report. Geneva, Switzerland: WHO, 2003. Corbett E , Watt C, Walker N, et al. The growing burden of tuberculosis: global trends and interactions with the HIV epidemic. Arch Intern Med2003;163:1009–21. Dye C , Scheele S, Dolin P, et al. Consensus statement. Global burden of tuberculosis: estimated incidence, prevalence, and mortality by country, WHO Global Surveillance and Monitoring Project. JAMA1999;282 (7) :677–86. Turnbull F . The epidemiology and surveillance of tuberculosis in New Zealand. In: Harrison A, Calder L, eds. Guidelines for tuberculosis control in New Zealand 2003. http://www.moh.govt.nz/moh.nsf/. Wellington, New Zealand: Ministry of Health, 2002:4. Ministry of Health. Tuberculosis. Immunisation handbook. Wellington, New Zealand: Ministry of Health, 1996:114–20. Woodhouse A . Tuberculosis and HIV infection. In: Harrison A, Calder L, eds. Guidelines for tuberculosis control in New Zealand 2003. http://www.moh.govt.nz/moh.nsf/. Wellington, New Zealand: Ministry of Health, 2002:9. World Health Organization. Global tuberculosis control. WHO Report 2003. Geneva, Switzerland: WHO, 2003. Correa AG. Unique aspects of tuberculosis in the pediatric population. Clin Chest Med1997;18 (1) :89–98. Starke JR, Jacobs RF, Jereb J. Resurgence of tuberculosis in children. J Pediatr1992;120 (6) :839–55. Nelson LJ, Schneider E, Wells CD, Moore M. Epidemiology of childhood tuberculosis in the United States, 1993–2001: the need for continued vigilance. Pediatrics2004;114 (2) :333–41. Burroughs M , Beitel A, Kawamura A, et al. Clinical presentation of tuberculosis in culture-positive children. Pediatric Tuberculosis Consortium. Pediatr Infect Dis J1999;18 (5) :440–6. American Academy of Pediatrics. Tuberculosis. In: Pickering L, ed. 2003 Red Book:Report of the Committee on Infectious Diseases. 25th ed. Elk Grove Village, IL: American Academy of Pediatrics, 2003:642–60. Department of Statistics. New Zealand census of population and dwellings. Wellington, New Zealand: Department of Statistics, 1996. Crampton P , Salmond C, Sutton F. NZDep91: a new index of deprivation. Soc Policy JNZ1997;9:186–93. Salmond C , Crampton P, Sutton F. Research report number 8, NZDep96 index of deprivation. Wellington, New Zealand: Health Services Research Centre, 1998. Ministry of Health. Guidelines for tuberculosis control in New Zealand, 1996. Wellington, New Zealand: Ministry of Health, 1996. Palme I , Gudetta B, Bruchfeld J, et al. Impact of human immunodeficiency virus 1 infection on clinical presentation, treatment outcome and survival in a cohort of Ethiopian children with tuberculosis. Pediatr Infect Dis J2002;21 (11) :1053–61. World Health Organization. Provisional guidelines for the diagnosis and classification of the EPI target diseases for primary health care, surveillance and special studies. Geneva, Switzerland: WHO EPI/GEN, 1983:83. De Zoysa R , Shoemack P, Vaughan R, et al. A prolonged outbreak of tuberculosis in the North Island. N Z Public Health Rep2001;8 (1) :1–3. Hill P , Calder L. An outbreak of tuberculosis in an Auckland church group. N Z Public Health Rep2000;7:41–3. Calder L , Hampton L, Prentice D, et al. A school and community outbreak of tuberculosis in Auckland. N Z Med J2000;113 (1105) :71–4. Milburn H , Gibilaro J, Atkinson H, et al. High incidence of primary tuberculosis. Arch Dis Child2000;82:386–7. Harrison A , Calder L, Karalus N, et al. Tuberculosis in immigrants and visitors. N Z Med J1999;112:363–5. Martin P . Tuberculosis in New Zealand: why do we have twice as much as Australia? N Z Med J2000;113:68–9. Balasegaram S , Watson J, Rose A. A decade of change: tuberculosis in England and Wales 1988–98. Arch Dis Child2003;88:772–7. Department of Statistics. External migration (December 2003 year)—hot off the press.http://www2.stats.govt.nz/domino/external/pasfull/pasfull.nsf/7cf46ae26dcb6800cc256a62000a2248/4c2567ef00247c6acc256e2f00703d5f?OpenDocument. Wellington, New Zealand: Statistics New Zealand. Carr H . Tuberculosis control in people from countries with a high incidence of tuberculosis. In: Harrison A, Calder L, eds. Guidelines for tuberculosis control in New Zealand 2003. http://www.moh.govt.nz/moh.nsf/. Wellington, New Zealand: Ministry of Health, 2002:12. Starke JR, Taylor-Watts KT. Tuberculosis in the pediatric population of Houston, Texas. Pediatrics1989;84 (1) :28–35. Chaulk CP, Khoo L, Matuszak DL, et al. Case characteristics and trends in pediatric tuberculosis, Maryland, 1986–1993. Public Health Rep1997;112 (2) :146–52. Driver CR, Luallen JJ, Good WE, et al. Tuberculosis in children younger than five years old: New York City. Pediatr Infect Dis J1995;14 (2) :112–7. Vallejo JG, Ong LT, Starke JR. Clinical features, diagnosis, and treatment of tuberculosis in infants. Pediatrics1994;94 (1) :1–7. Parslow R , El-Shimy N, Cundall D, et al. Tuberculosis, deprivation and ethnicity in Leeds, UK, 1982–1997. Arch Dis Child2001;84:109–13. Berggren P , Gudetta B, Bruchfield J, et al. Detection of Mycobacterium tuberculosis in gastric aspirate and sputum collected from Ethiopian HIV-positive and HIV-negative children in a mixed in- and outpatient setting. Acta Paediatr2004;93:311–5. Harrison A . Awareness, clinical features and early diagnosis of tuberculosis. In: Harrison A, Calder L, eds. Guidelines for tuberculosis control in New Zealand 2003. http://www.moh.govt.nz/moh.nsf/. Wellington, New Zealand: Ministry of Health, 2003. Ministry of Health. New migrant health and disability screening rules (press release). Wellington, New Zealand: Ministry of Health, 2004. The Asser Trust funded this study and GlaxoSmithKline funded the GSK Paediatric Respiratory Fellowship post held by SH. Presented at the American Thoracic Society/American Lung Association International Conference, Seattle, 2003 (A608).